Are states hooked on money from games? 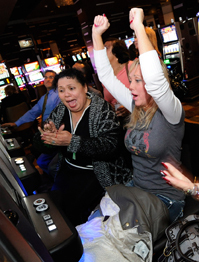 Gambling was once illegal and widely regarded as immoral in most of the United States, but today it is a popular pastime, a $90 billion industry and an important source of revenue for state and local governments and Indian tribes. Lotteries in 43 states and the District of Columbia collectively generate $18 billion in revenue for state and local governments. Commercial casinos contribute $8 billion, while Indian tribes negotiate payments to states for permission to operate casinos on tribal lands. Casino companies promise jobs, economic development and other payoffs, but critics say the benefits are exaggerated and the social costs of gambling ignored. Lottery advocates view the game as a politically palatable revenue source, while critics warn against encouraging compulsive betting by lower-income residents. The criticisms are having little impact, and gambling may become more pervasive with the advent of legal online poker and other games.